Guy Himber is a great guy. While it took him awhile to finally get all these questions answered he was always quick to respond to any reminder and all follow-up requests. His constant correspondence helped make this interview the most informative it could possibly be. The movie is his all-time favorite to have worked on which just goes to show how enjoyed the production was for those working on it. By the same token the production of Super Mario Bros. has come to be an incredibly fascinating and enjoyable experience for us fans. This interview only helps in our understanding of one of the most iconic elements of the film: the Goombas and Allosaurus Rats, characters in their own right. Steven Applebaum: Could you tell us a little about yourself and how you got into design and animatronic-engineering, and how that led you into the film industry? SA: How did you begin working for MEL? GH: Russ Shinkle invited me to join the crew as a mech. All the guys at MEL became long time friends as a result of my time there. I have worked with them several times since the Mario days. SA: What was your position while working there? GH: Mechanical Design and fabricator. SA: When in the film’s development did you and MEL begin work on the Super Mario Bros. project? GH: They had already started some prototype mechs and mockups for the Goomba characters. It was all still in early testing. SA: We know that MEL pitched a "prototype" Goomba head to Lightmotive to receive the contract for developing the puppets. Do you know what differences, if any, this Goomba head had from the final work? GH: I don’t remember seeing this. SA: Did MEL submit any other prototype puppets for other creatures? If so, did they also have any differences from the final works? GH: Not that I worked with. SA: How familiar were you and the other designers with the Super Mario Bros. games before working on the film? Did the games influence the design-process or movements of the puppets in any way? GH: I enjoyed the games when they first came out. There are some clever references to them throughout the movie, but I think they vastly expanded the plot in order to get a full film out of it. "I think they vastly expanded the plot [of the games] in order to get a full film out of it." 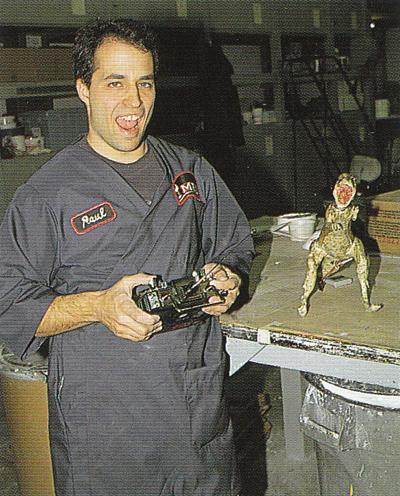 SA: Patrick Tatopoulos was the lead creatures designer and supervisor for the project that designed the Goombas and other creatures that MEL would later develop. 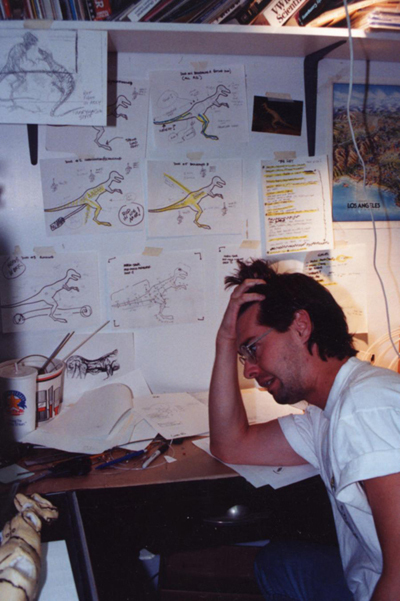 How difficult was it realizing his designs through actual, working puppets? Did any concessions to his designs have to be made to the puppets to allow their creation on-budget or on-time? GH: Patrick is a talented Creature Designer. The nice part about his ideas is that they usually tend to be based in nature or a form of it that is familiar. As such, they usually translate well into real-world objects. The sculpts (beyond some adjustments for the underlying mechanisms) stayed pretty true to the 2D artwork. SA: How was work in creating the Goombas divided? What did you do to help in their creation? GH: The mech design of the Goombas was the responsibility of Russ. I did some work helping in the assemblies (when I wasn’t occupied with other duties). There were several other folks that helped with the mech assembly (Fred Folger, Doug White and others). SA: How closely did you and the team work with Russell Shinkle (lead mechanical Goomba designer) and Patrick Tatopoulos? What was it like trying to balance the mechanical and artistic sides of their work? GH: Russ and I became friends on some previous projects (Radio Flyer and Wild Hearts Can’t Be Broken). When he started working at MEL, he needed an additional Mechanical Designer/Builder on the team. He gave me a ring and I happily joined in. Patrick and I dealt with each other a few times on the project (he had actually met me years ago when I was working on Edward Scissorhands for Stan Winston). Patrick also had a long standing friendship with the folks at MEL from when he first came to America from Europe. Later Patrick, Russ, and I all worked on Stargate together. When Patrick later started Independence Day, he asked me to take the job of Shop Supervisor with him. Patrick and I have been working together ever since. As in all animatronic characters, there are always some changes that have have to be made to the 2D artwork in order to allow for skin movement (sculpting in neutral positions vs. extreme expressions), sometimes small changes are made in proportions in order to improve mechanical function or allow for easier placement of cables and servos. The goal is to keep as close as possible to the original designer’s art. SA: Did Patrick create concepts for the miniature dinosaurs MEL would also create? Were there any differences between these concepts and the final puppets in terms of size or shape? GH: There were some general designs presented, but nothing too extreme – they are pretty much just miniature Allosauruses. SA: Was there an official project name for the Goombas and miniature dinosaurs, or nicknames the crew used? We've taken to referring to the three types of Goombas as ape-heads, lizard-heads, and snake-heads, and the miniature dinosaurs as "Allosaurus rats". GH: There was only one full snake head mech (built on a ‘tentacle’ style mechanism). SA: You've indicated that you designed and built the miniature dinosaurs. Can you explain the work that went into building them and how they worked? GH: As I recall there were three dinos altogether: one radio-controlled version - self-contained, and two cable-driven dinos with an umbilical of cables that led to multi-axis cable controllers to operate them. The radio-controlled puppet had minimal movement and was used for scenes where cables couldn’t be hidden on set. For the two cable-controlled puppets, one of them had cable that ran out the tail [while] the other had cable that ran out the side of the puppet and was supported by a rod that could mount to the off-camera side for shooting. SA: How difficult was it to operate them? How many puppeteers were required to maneuver them and how much mobility did they have? GH: Anywhere from 1 to 3 puppeteers depending on the complexity of the performance needed. SA: Who made the skin that fit over the miniature dinosaurs? Do you know what it was made of and whether any skins with a different coloration or design were produced? GH: Skins were foam rubber. 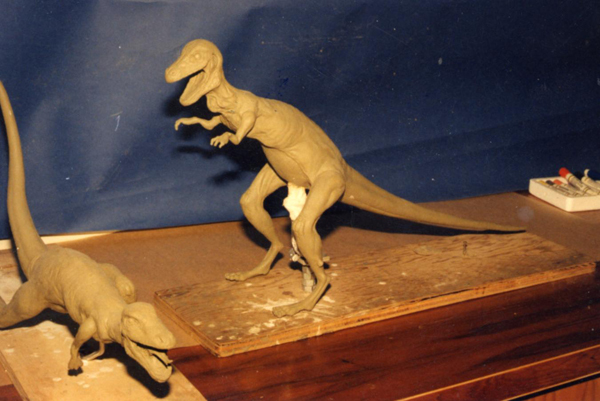 The dinosaurs were sculpted over a mechanical core that I provided to the Art Department. This extra step meant that the skin could pretty much be baked (MEL ran their own foam rubber), seamed, and placed directly onto the mechanisms with minimal adjustment. 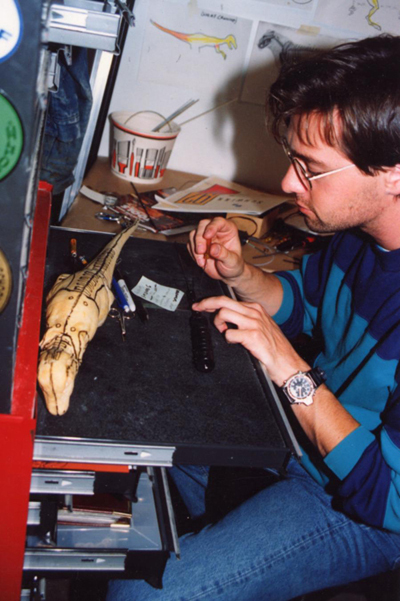 SA: About how much did it cost to produce a single working miniature dinosaur puppet? GH: Couldn’t say! I didn’t do the budget on the show. SA: It seems like there was a lot of work put into the smaller dinosaur puppets. We've heard from Mark Jeffrey Miller (the principle that played the street vendor) that a scene was shot where his character drops some food off his cart and one of the miniature dinosaurs picks it up and runs away. According to him, this scene took 12 hours to satisfactorily shoot. Were all of the scenes involving the puppets this difficult and time-consuming to shoot? GH: Hey that’s right! We built a ‘running rig’ on some precision steel rods and gear that allowed for a simple running motion through frame. I forgot about that one. It didn’t get used too much beyond the mentioned scene. Some shots are well planned ahead of time and we have the opportunity to plan and ‘de-bug’ the shot. Often, [a] spontaneous shot will occur at the moment of shooting (as ideas get presented) and you just shoot by the seat of your pants. SA: The above scene with the street vendor was actually cut from the finished film. If you were involved in its shooting, can you describe what exactly happened so we can get an idea of what we missed? GH: It was a lot of things to coordinate. Between grabbing an item that had to fall on the ground (which was random and imprecise) with the dino’s head and mouth movement and then timing a run, it required a ‘perfect storm’ of luck and timing. 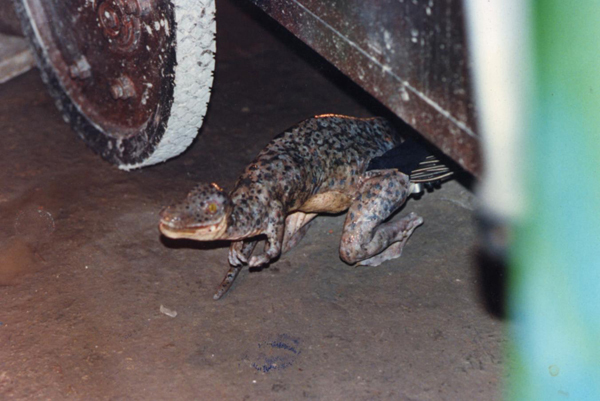 SA: The only scenes involving the miniature dinosaurs that are seen in the final film were one at the beginning wherein Mario (Bob Hoskins) and Luigi (John Leguizamo) fall off a walkway onto the street below and see the dinosaurs eating fungus and a second time in the desert, where they pick at Iggy (Fisher Stevens) and Spike’s (Richard Edson ) clothing tags. Do you know of any scenes involving the miniature dinosaurs other than the above street vendor scene that ended up on the cutting room floor? GH: You forgot one! The movie also includes the scene where we see one of the dinosaurs ‘sneezing’ having been caught in the backwash of the Jump Boots. As far as cut scenes, I remember shooting one or two other scenes, but don’t remember the particulars. SA: We're hoping you can settle a mystery we have. 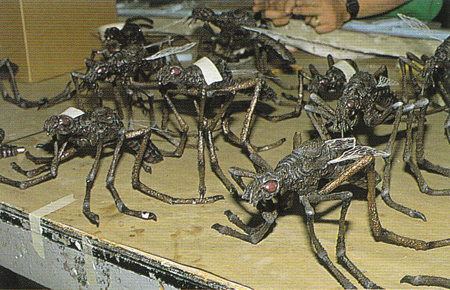 The Japanese movie programme depicts several large mosquito-like creatures that aren't seen in the final film. Do you know what they were and what they were built for? Were they fully-functional puppets or just props? GH: I think they might be shots of some giant mosquitos that MEL built for a different movie. Almost positive that is what they are. It’s been a few years! SA: If they were puppets, what was the extent of their functionality? Do you know if they were ever shot in the film or why they didn't make an appearance? "Skeeters," from the film of the same name. Why did they end up in the SMB Japanese Movie program? SA: Were any other puppets commissioned whose appearances were later cut from the final film or were simply never used at all? 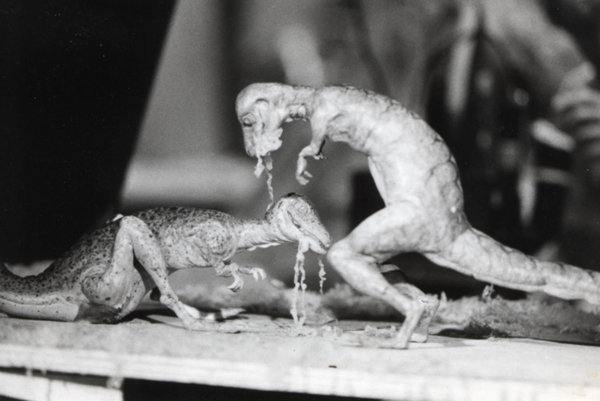 SA: Did the fact that many of the sets were built around the concrete remains of a cement factory make it difficult to run the puppeteering lines for the creature effects? It also seems like the sets weren't on raised platforms that the puppeteers could work from underneath. Did that make it difficult to keep the puppeteers off-camera? GH: I had lots of prep with the production crew so they were prepared with raised stages when needed. Otherwise, we just hid the cables within the framing of the shot so they wouldn’t draw attention to themselves. SA: After speaking with Michael Harding, one of the actors that played a Goomba, we know that some of the movements of the puppet was performed by the actual actor. How much work was divided between the actor and the puppeteers? 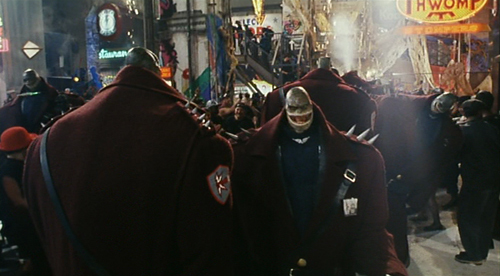 The suit actors saw through the chest area of the Goombah – look for the black mesh material below the creature’s heads. Their left hand was real and provided the suit’s left hand movement (although the bend was cheated and the shoulder height was padded out to make it seem as if the arm connected at the creature’s shoulder – instead of mid upper arm where the performer’s are truly came out). The actor’s right arm was hidden within the character’s body. With his right arm, the actor operated a low profiled multi axis cable control mounted in front of him on his chest. This provided the Goombah’s two to three axis (can’t remember how many) of head movement. A finger operated trigger control on the handle would allow the jaw movement of the Goombah. All of the character’s facial functions were puppeteered via Radio control with two off-camera puppeteers. There was a special additional setup for the Snake head Goombah, than ran two big 2 axis cable controllers to snake around the boa like neck movement of the RC snake head. (there was just one of these). I seem to remember an air operated extending tongue for one of the heads too, but I don’t thing it worked very well. SA: Michael also indicated that he and the other Goombas were treated very well mostly because of MEL. What sort of interaction did you and the rest of the team have with Mike and the other Goombas? What led MEL to demand such good treatment? GH: Allan Apone, one of the owner’s of MEL, is a fantastic man. He made sure that the actors were treated like people on set (instead of props). Strict limits were set as to how long the performers were allowed to be in costume without giving them proper breaks and hydration. They even had a masseuse brought in for them on a couple of days. SA: Do you have any concept artwork or diagrams of the different creatures or photos of yourself and the crew working that you could share with us for the site? GH: I have some I can share, will need to do some digging. SA: Do you have any funny or interesting stories about your experience working on the film? GH: This was my ALL TIME favorite film to work on! The location was fantastic. I was a young bachelor surrounded by beautiful Southern college girls. I had more money in my pocket then I could spend, so when we weren’t working, we were playing on the beaches and ‘whooping’ it up in town. I am pretty sure this is what heaven will feel like. SA: Did you get to attend the film’s premiere? GH: NOPE, I was on location with another film by then. SA: What did you think of the film when you first saw it? In terms of your work? GH: I enjoyed that sets and Art Design tremendously. It’s always great to see your work in big screen form. The spirit and energy of the film was great. I don’t think it was a huge theatrical money maker, but I know it stayed busy in Video and DVD. "The spirit and energy of the film was great." SA: What do you think of it now? In regard to your puppets and how they compare to modern animatronics and CGI? GH: There is a charm to real things that I always connect with. 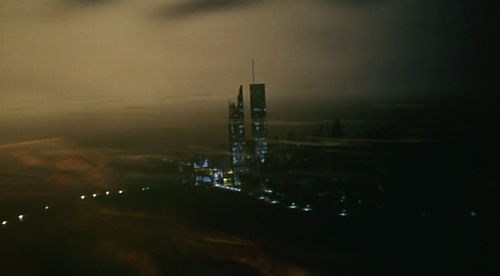 Good CGI is a great tool (in that it doesn’t have to worry about gravity or the limits of mechanics), but I often find it distracting in that it is often so obviously unreality. I am sure that kids of today are much less tuned in and forgiving than I am (because video games have cultured their eye as to what to expect from entertainment). Like anything, great puppets and CGI are great to watch. Bad puppets and CGI are crappy to watch. My latest passion has been building/designing in LEGO. Last year I won best Art Piece at BrickCon in Seattle and this year I won Best Human Character and Best Steampunk. SA: Do you know what became of the Goombas, miniature dinosaurs, and other puppets once the production ended? GH: Most went to the production company. I am sure that MEL kept a few of the items as part of their promotional rights. SA: Any final thoughts about the film or your work on it? GH: Any time you get to hang out with that many interesting actors you are going to have fun on set. SA: Thanks for taking the time out for this interview, Guy! The puppets you helped make with MEL are definitely one of the most iconic and well-loved elements of the film. Hearing the work you put into the Allosaurus Rats especially will be a great joy to us fans on the site.